It’s funny how one of the simplest games of all time - Space Invaders - can still be so completely addictive. One of thousands of games on my cocktail arcade cabinet, and a game that you can easily play in some form or other for free on PC, I’ve nonetheless spent more time with Space Invaders on my table than anything else, trying to get myself a top score that properly reflects the skills of someone who has been playing this game in one form or another for most of his life. It has become part of my morning ritual, in fact. I’m an early riser, but it does take me a while to get going in the morning. What I’ve found remarkably effective in recent weeks is to put five “credits” into the arcade cabinet when I wake at around 6 a.m., and play Space Invaders for half an hour or so as I have a coffee. For whatever reason, the simple and understated nature of the game gets me in a good spot, and by the time I’ve finished my coffee and “credits” I’m ready to get cracking with the day’s work. I don’t know what counts as a good score in Space Invaders now, but currently my high score is a little shy of 4000 points, which translates to getting deep into the third wave of the invaders. Not including the flying saucers, which appear briefly at the top of the stage twice and are worth a premium points bonus to hit, each wave in Space Invaders is worth precisely 990 points. I had that number memorised long ago. Even with other classic games I don’t remember details that specific; I couldn’t tell you the combined values of all the dots in each Pac-Man stage, for example, and I really love Pac-Man. I just find Space Invaders to be so eminently replayable and addictive that I’ve played it enough to understand its various structural foundations. Those flying saucers that I mentioned previously is worth a variable number of points. Some are worth as little as 50 points, and others can net you 300. A lot of people think that this points bonus is randomised, but it’s actually not. It’s determined by how many shots you had fired out of the ship before the flying saucer appears. You’ll get 300 points for the flying saucer if you hit it with the 23rd shot fired from your ship for the first flying saucer, and then 15th shot for the second. If you want a really good score with Space Invaders, counting bullets is a critical strategy. Then there was the rainbow effect, which is always a fun Easter egg to gun for. 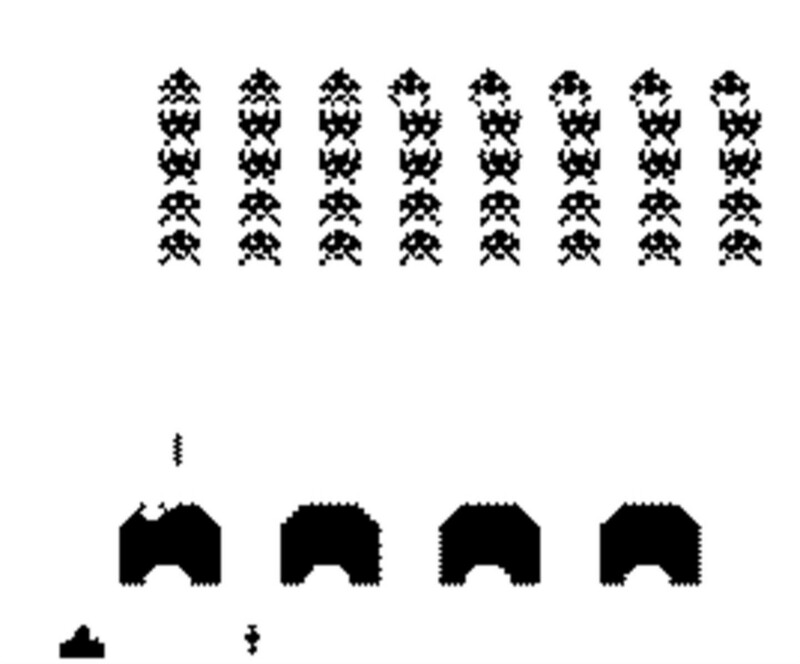 As everyone knows, there are three different kinds of alien in Space Invaders; two rows of the blob-like basic enemy, two rows of the bird-like mid-tier enemy, and then a single row of the squid-like elite enemy. Because these enemies all move in a block and at the same pace, it was by far easiest to defeat them in order, from lowest to highest. But when there is only one invader left in the level, if it happened to be one of the blob-like enemies, it would then trail behind it a “rainbow,” as it moved across the stage, which was visually fun, though it had no in-game impact. I am quite good at getting that effect when I want to these days. One of the things that always amuses me about Space Invaders is how readily people chalk it up as being a “simple” game. The original version (and the one I play) is literally in black & white. So early was this game that the first time it appeared in colour was when the developer of the original game, Taito, stuck cellophane strips across the screen so that as players played it looked like the black & white graphics were now in colour. But far from being “simple,” I actually think that Space Invaders is one of the most incredible uses of minimalism we’ve ever seen in a game. There’s a reason that in all those modern interpretations of the game, and everything else associated with Taito, the actual design of the aliens has not changed in the slightest. See, Space Invaders is a remarkably intense game that’s really quite horrific for all its abstraction. Despite working with really minimal graphical power, the developers behind the original game were able to achieve a couple of really important things. Firstly, they were able to make the aliens look really very alien. Each of the three different aliens have an otherworldliness to them; they each feature odd angles and shapes that mean they can’t be compared to anything that we see on earth. Given that each alien only has two frames of animation, and is constructed of a tiny number of pixels, this is a really impressive visual achievement. The second achievement is the way that the aliens move. The robotic block, in which they’re neatly arranged in rows and move steadily from left to right, and then back again, is intimidating because, firstly, it’s overwhelming (you’re one ship against a very large wave), and secondly, because that kind of motion is, again, alien to us. Humans are fundamentally individualistic beings, and the image of a large group of beings moving in complete unison, without displaying individual behaviours and personalities, is something that we perceive to be hostile. For proof, consider that the greatest existential threat in Star Trek or Mass Effect is the Borg and Reapers, respectively; species that specialise in stripping individuality out of their subjects and forcing them to behave as a hive mind. 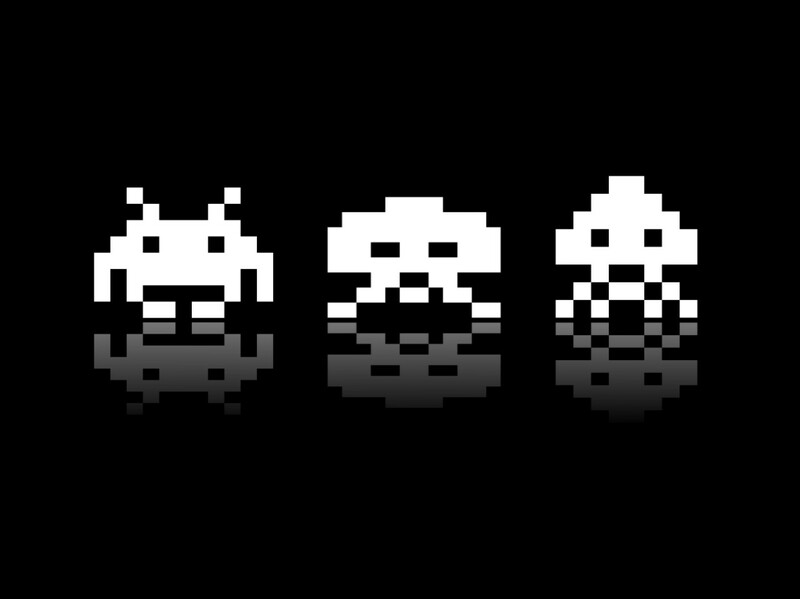 Space Invaders might have been programmed in the way it was out of a limitation in power, but the impact of having that slowly descending block of uniform aliens in front of you is powerful. And then there’s the music. 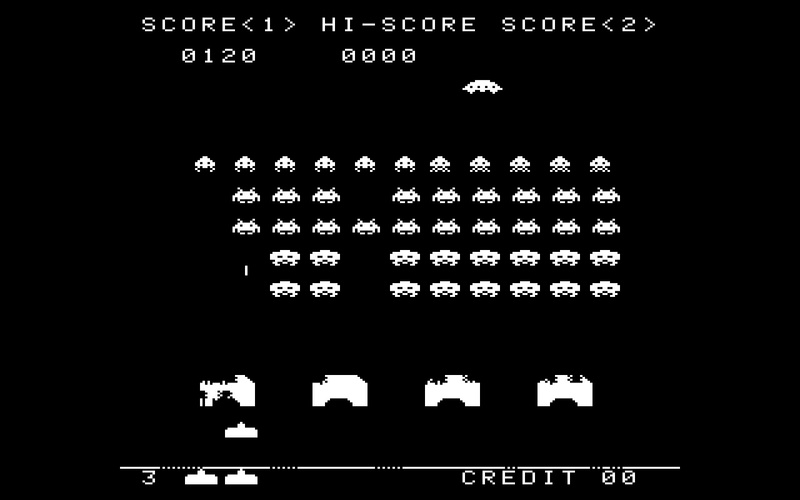 Space Invaders move across the screen in time with a looped four-note music track, and it is quite incredible the atmosphere that the game develops thanks to that soundtrack. Each of the four notes are deep and have a otherworldliness to them in that, as with the movement of the aliens themselves, are devoid of the warmth and ‘humanness’ that we usually associate with music. Their repetition is mechanical, cold, like a metronome. The music is indeed rhythmical, and as the aliens are shot, they speed up, with the music following their speed. Like a metronome never misses a beat, and is always spot on in the middle of a beat of music, so too is each of Space Invaders’ four music notes. With music, there’s greater variance in timing than many people realise; a note played a little ahead of a beat in music will have a different impact to a note played at the end of a beat, especially when performed in the context of all the other notes in a score. Much of the creativity in dancing, for example, comes from each person’s interpretation on how they should move within the frames of a single beat of music; do you stretch a note out to its very limits, or introduce a “skipping” rhythm by playing in the first part of a musical beat. The space invaders are explicitly moving to the game’s music, but it can’t be called “dancing,” because it’s so mechanical and perfectly in time with each beat. This, again, creates a sensation of otherworldliness and hostility. It’s almost irrelevant that the aliens in Space Invaders are shooting missiles at you this whole time. Sure, it’s the missiles that will be likely to cause you to lose all your lives, and bring on the game over screen, but in all the time that I’ve been playing Space Invaders, the far more terrifying prospect is one of the aliens actually getting to the ground. I feel myself getting more stressed and taking greater risks to try and clear away the aliens that are getting closer to the ground; I’m willing to risk being shot in order to make a big move out from the covers that the game provides in order to try and clear the closest row of aliens. This is partly because it’s an instant game over if an alien lands home, but there’s more to it than that. There’s an existential terror in the basic thought of these monsters getting closer to me and taps into the basic fight-or-flight response, and it’s a combination of the game’s graphics and soundtrack that does that. There’s a continuing expectation in the gaming community that “good graphics” means either hyper-realistic, or hyper-detailed art. The same goes for the music; games try and out-compete with one another to produce hugely complex orchestrated scores. But, really, one of the greatest examples of game art came from as far back as 1978. Space Invaders is a genuine masterpiece of a game, all these years later. It might be highly minimalist in design, but not only is the basic gameplay enjoyable and challenging to this day, but its visuals and music are just so masterful that, to this day, we still love the artistry of Space Invaders, even if we don't always acknowledge that.